10 years since GFC. What now? The Australian Legal and Constitutional Affairs References Committee headed by Senator Louise Pratt officially gave bank victims ten days to respond to their current inquiry - Resolution of disputes with financial service providers within the justice system. On Thursday the 21st of March they had a public hearing. Plenty of insiders usually congregate at these events - lawyers, industry bodies etc. Here we saw the Australian Bankers Association and AFCA featured and giving responses ..... but one man representing bank victims was somehow allowed to present. 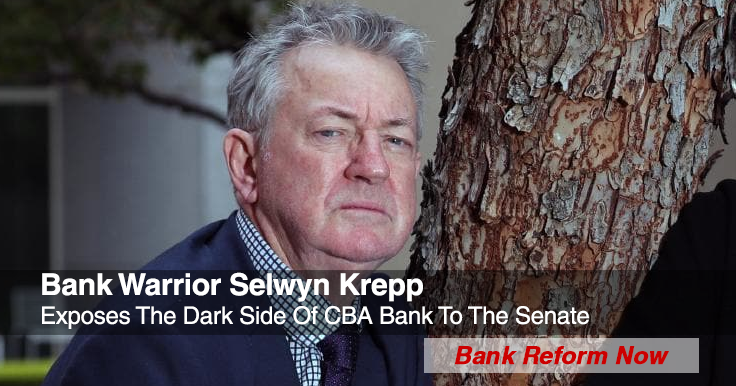 Bank warrior Selwyn Krepp had something to say and it was much more than the Senators were expecting. Mr Krepp has detailed to CBA various breaches of the Corporations Act, the NCCP and the Code of Banking Practice, plus the failure of their code of conduct. This is a horror story that also was in large part responsible for the suicide of the Krepp's lawyer. CBA has consistently and persistently refused to apologise and remediate Mr Krepp. The Senate must be wondering how CBA's CEO Matt Comyn sleeps at night when his bank can treat a customer in the way the Krepps have and are being treated. CHAIR: Welcome. Do you have any comments to make on the capacity in which you appear? Mr Krepp: I currently reside in Flemington, in Melbourne, and my occupation is probably 'a disposed-of resort manager'. CHAIR: I invite you to make an opening statement. honoured with a Commonwealth award in the Pacific region for services in banking and also contributions to the community, reflecting dedication, professionalism and the financial sector. My fall from grace was in 2013. In the absence of any arrears, breaches or defaults, our family business, which was in postcode 4870, was foreclosed by one of the big four banks. The bank foreclosed without any court orders or any court processes. There were no orders whatsoever. The bank never got court orders—nor would they have got court orders, because of our position of no arrears, no defaults and no breaches, and there were no extraneous circumstances in the area that we were living in. They would never have got court orders, because we actually had a loan extension for our lending. It went through until October 2013, and we were foreclosed in February 2013. Having paid income tax the previous year, holding evidence of refinance and an ability to pay down the loan and additional unencumbered real estate to cover our securities if required, premature foreclosure came about in February 2013, in the absence of any orders and without the prescribed necessary borrower and guarantor consultations. I hold documentary evidence of our facility as having its term and loan contract extended in 2013. Disingenuous receivers were appointed by the bank, resulting in receivership, including missing moneys, underselling of corporate assets, unlawful use of corporate funds by receivers and statutory noncompliance—all with the bank's knowledge. Over 250 accounting anomalies and irregularities occurred during receivership. The bank released corporate assets in the underselling process and created loan residual debts—noting that they didn't have any court orders in the first place to foreclose on us. The bank allowed the receivers to sell the business, in addition to the listed assets in the letter of appointment, which meant that the receivers returned to us a gutted company—and I was expected to generate income to pay off procedural debts in excess of $2.9 million. Without any guarantor consultation, the guarantors are now required to pay this money, without the bank exercising any equitable duty of care and receivers not applying best efforts and best endeavours. It simply did not happen. Unscrupulous lawyers and same-for-same legal representatives were involved for all parties. We contend that a conflict of interest was prima facie in our affairs. Bankers and receivers have cross-referencing indemnity for their own personal protection. All costs and fees were funded and charged back to our own accounts with the company under realisation costs. Receivers costs in excess of $345,000 are without particularisation of the expenses. Similarly, other expenses totalling in excess of $86,000 remain without itemisation. I've met with the bank CEO. Action points were taken away from our meeting by the bank on all occasions but never dutifully answered or responded to. I attended all royal commission hearings in Melbourne, Brisbane and Sydney into misconduct. I witnessed senior bank executives stating that their systems were broken and staff had let them down. I experienced bank CEOs clearly saying that they should have done more for their customers, and here I am with a letter dated 1 March 2019 from the office of the CEO, and it says on page 2, paragraph 1: 'I have requested your file be handled from here by our Group Credit Structuring team to continue the bank's usual processes of recovery.' Statements made by the bank at the financial services royal commission and at the HEC, the House Economics Committee, which I attended, are proving to be lip-service only and include a magnitude of false narratives. Policies, relief and corrective measures have not been deployed, as told through the various inquiries. I've attended bank AGMs and I've asked questions of the chair. What is stated is not what is delivered. I asked why. Questions on notice were, again, never actioned. CEOs, past and present, will not reply to our letters with requests for information. The chairman of the board will not respond to shareholder queries. The GM of Group Customer Relations was similar; they will not answer our correspondence. They all hide behind the corporate banner. Banks are not honourable. They do not take ownership. They conceal material facts. They also capitalise on opportunism. They're not fair and reasonable in the spirit of customer negotiations, they excel in advantage-taking in what should be reasonably disclosed, and they benefit by legal injury. I am now faced again with recovery action, as per the bank's letter. I'm unable to afford legal representation to match the bank's legal team. As a family, we are crimeless victims. Breaches exist with my financial service provider and their performance. I have identified to the bank on no fewer than 30 occasions the disparity in their actions, their conduct and my documentation. I've communicated to them on the various breaches of the Corporations Act, the NCCP and the Code of Banking Practice, plus the failure of their code of conduct, whilst they also ignore 'know your customer' legislation. Breaches have significantly also been included in the release of confidential information and borrower privacy. Regarding letters of acknowledgement and responses I have received from my bank, I hold 17 written apologies for bad behaviours and poor performances, including correspondence from the CEO. That still hasn't stopped them from wanting to commence their recovery process. Documentation is a challenge. Requests are held in excess of seven or eight months to get anything actioned. Regarding permissions on external fraud investigations to the bank's nominated agency, again there was no response. Banks are not delivering to the law. Many of their past wrongdoings have developed a culture of greed and they're not acting in a responsible or accountable manner as good corporate citizens. Banks have lost trust and respect from customers based on poor and bad behaviours, plus they have paid retainers to legal firms to maintain loyalty to banks. This occurs at the risk of permanent damage to victims over the long-term. In summary, initially our funding was comprised of institutional moneys, with various terms and conditions, as opposed to a retail loan for a retail family venture. Obviously, the bank's irresponsible lending became questionable, but there was no response. There is convenient impairment of loans with no defaults, no arrears, no breaches and no court orders. They engage dishonest and disingenuous receivers. Unscrupulous lawyers, acting for all parties, are out to win at all cost. Residual loan debts were created by underselling our corporate assets. The bank will not provide copied documents. The bank will not freely respond to questioning. Abuse of process to borrowers and guarantors is common. Self-omission of record-keeping, broken systems and incompetent staff are on file. And banks want to realise on my personal assets for their bad banking, created by them, to compensate them for their errors. The ability and capacity to engage legal representation causes additional hurt and pain in a climate of inadequate resourcing. An imbalance exists for all bank victims. Morals, ethics and good citizen behaviours are void when dealing with banks. Goodwill and good faith are unheard-of when negotiating with financial service providers. It all becomes greed and out to win at all costs. Antecedents, character and loan history are a minor contributor to outcomes. Processes are abused and enjoyed by financial service providers acting in a position of dominance with unlimited resources to continue their plight of supremacy. Programs of model litigant by Bank Warriors Australia and Equality of Arms are all keen to pursue it to gain fairness and processes across the financial industry. Again, three out of the four banks have said yes to using model litigant in their standard processes. Adoption must be uniform across the financial sector. Any questions? CHAIR: Plenty, thank you. In your submission, you canvas a broad range of issues that deal not only with your own circumstances but with many of the other banking victims. In order to get a bit of clarity and use your situation as a bit of a case example, can you describe for us why you believe you ended up in a dispute with your bank and what steps you have been through to try and resolve that. Mr Krepp: They considered that the loan term had expired regardless of me holding documentation to the contrary. Senator IAN MACDONALD: How can they do that? Mr Krepp: That's a question you might be able to help me with—how can they do that, exactly. They are in denial. Senator IAN MACDONALD: I am sorry, Mr Krepp. We must be missing some factor. If you've got all the documentation, perhaps you should have gone and seen the previous witnesses and got them onto the job or something, because it seems you would have an open-and-shut case. Mr Krepp: I share your views and I would like to think the same. Senator IAN MACDONALD: So why did they say they terminated you? Did they not like the way you did your hair? Did they hate your grandmother or something? Mr Krepp: No. Their response was, 'The facility has expired,' and they transferred the letter of appointment for the receivers. Senator IAN MACDONALD: But you did not owe them any money, you had an unencumbered property as security and you had paid all your debt. Mr Krepp: I had refinanced—no arrears, no defaults, no breaches—and the letter of appointment clearly states an 'expired loan facility'. Senator IAN MACDONALD: You said you had letters of apology and you have been to see the bank, so how did they explain it away? Mr Krepp: A lot of letters of apology relate to other bad conduct, other misdemeanours—whatever else they've done. As for the issues on foreclosure, they took the action points away and never dutifully responded to them. Senator IAN MACDONALD: But I think you said you saw the CEO. He looked you in the eye and said what? Did he say, 'Sorry, I don't like the colour of your hair'? Mr Krepp: I looked him in the eye not once but on four or five occasions. Senator IAN MACDONALD: So what did he say? CHAIR: Can I ask you what your view is about why you may have been targeted in this way? Mr Krepp: It could very well have been the postcode—4870—which is Far North Queensland. It could also have been that we were in the hospitality industry. CHAIR: We've had some discussion with the previous witness where we talked about the risk ratings that businesses have and that, therefore, particular loans might get targeted in order to meet the prudential requirements of the balance sheet of a bank and that particular sectors and particular areas might get targeted because they are deemed as being slightly more risky. What's your perception of it? Senator IAN MACDONALD: I wouldn't think Cairns and the tourism industry in Cairns would be a risk area. As you know, I come from up that way. Senator IAN MACDONALD: Did you name the bank? Mr Krepp: I'm happy to name the bank for you. It happens to be the CBA. Senator IAN MACDONALD: Okay. You would seem to have a classic case for the new authority to look into. Mr Krepp: I think we probably exceed it because of the dollar value. Senator IAN MACDONALD: How much is involved in round figures? Mr Krepp: We're looking at debts in excess of five, effectively. Senator IAN MACDONALD: $5 million? Senator WATT: Can you refresh our memories—apart from trying to resolve the issue with the bank directly, which obviously hasn't been successful, what other steps have you taken? Have you sought legal advice? Have you started legal action? Have you gone to ombudsmen? What else have you done? Mr Krepp: In respect of recourse, unfortunately the amount exceeded the FOS's discretion, as it does now with AFCA. I took legal advice. Because the assets were generally undersold in value—and that's a common statement made by many people; I've got examples that were undersold in value—I was required to make a submission to the bank on two occasions, which cost me, off the reserve I had, in excess of $150,000 to employ two solicitors and a forensic accountant to comply within the time frame. Having spent $150,000, I made two submissions to the CBA, one dated 4 May 2015 and the other 21 June 2015, and both of those submissions were met with no response. I now believe that all I did was provide them with a platform of knowledge of what I'd known and what I was able to glean from the way the receiver remedied the business in my absence. I plucked all that information from ASIC from the payments and receipts forms, 524s, and I was able to reconstruct it. When I brought this information to their attention they then bullied and bludgeoned me into accepting a deed of compromise and forbearance. They even wrangled in my nephew's wife, who was not a property owner or a guarantor. She was also included in the deed. Once upon a time she and I had had a loan, but she no longer owned property and she was never a beneficiary of the company. She was roped into executing the deed. I had very few options. I was given no room to move. I was financially embarrassed, having spent $150,000 of my last earnings. I had a deed that was executed. I didn't complete the settlement because it wasn't what I wanted. It wasn't fair. It wasn't reasonable. The position was that I was told that unless I signed it they were going to sell me up. I had a solicitor with me at the time—and it's a rather sad tale. When it was due for settlement, he met with me and said: What are you going to do? You've got to settle it.' I said: 'Why should I settle when we're victims? We've done nothing wrong.' It's broken down the relationship with my family, with my son, because he thinks I've lost everything. My solicitor who came around to meet with me took his own life on 5 or 6 March 2016 believing that he had been done over by a corrupt system. I've been able to maintain our status, and now I'm faced with this. Mr Krepp: and I've probably seen him since, and it's, 'We'll get back to you in writing,' and that's what they write to you—a letter saying that they're going to do recoveries on you. I'd done nothing wrong—no arrears; no defaults; no breaches. They gutted the company, to their own satisfaction. And that's why we're here. CHAIR: When they've taken that action before any evidence of a problem in the company, it's very hard to unpick, after the event, when the asset itself has been destroyed. Mr Krepp: I probably—though not realising, through not being able to afford help, that they had no court orders—should have sent the receivers packing. But I respected that they were the mortgagee and so forth or whatever the case might be. So that's why I'm looking down the barrel at the moment. I've got correspondence with the CEO at the moment, and that has not been answered. And that's not uncommon. The correspondence has been there since a couple of weeks ago, and it's not uncommon for them not to answer correspondence. Even their general manager of customer relations—they deny as to answering correspondence, as do the board as to answering correspondence. A question you asked me, Senator Pratt, a little earlier, was along the lines of: 'What went wrong? Why aren't they answering?' I'm not confident, hand on heart, that the CBA is being run by the CEO or by the chair, when they won't give you correspondence. Senator IAN MACDONALD: Sorry? Say that again? Mr Krepp: I'm not confident that the CEO of the CBA and/or the chair are in control of what's happening. Senator IAN MACDONALD: So who is in control? Mr Krepp: I tend to look at: some of the correspondence is very legalistic, and they're trying not to use legalistics. They've told me quite clearly that they've sent my file out to be externally reviewed. My theory on that is: if you send rubbish out, you'll get rubbish back, if you don't tell them the whole facts. CHAIR: So can I ask what you think should've been done to resolve the dispute earlier? One of the things that has been put forward to us is that it should be impossible to move into foreclosure-type proceedings without putting a dispute resolution process in place first. Mr Krepp: I would agree to and endorse that. As I said, I had refinance arranged to activate. I had money to pay down the loan. I had unencumbered properties as security if they thought that there was a security risk. I paid tax the previous year, trading exceptionally well. CHAIR: What steps should be taken now, given what was resolved in the meantime? What resolution do you propose in your own circumstances? Mr Krepp: Firstly, I expect the recovery process to be backed off. I know remediation is on everybody's mind, and I'm happy to meet with them on remediation. They haven't asked me to do any calculations as to that. When you're operating a business and you've got an adjusted net profit—and don't get me wrong: we worked hard, 24/7, eight days a week, my nephew, my son and I, running our business; we minimised our outgoings and maximised our incomings. Mr Krepp: No. The business was completely gutted, and I only got a company back. Mr Krepp: I think that, at the time, what the bank should have done was to, at least, negotiate with us and/or speak to our guarantors. That did not happen. Senator IAN MACDONALD: Did you have guarantors? Mr Krepp: It was a company, and I was the guarantor—I and my son were. CHAIR: Can I ask you what advice you've got for people in disputes with banks in the future? CHAIR: When it comes to foreclosing on someone, surely it should require a court process. Mr Krepp: I would have to say yes because, if it didn't, you'd find that foreclosures would come from all angles. If there was a court process, they would possibly review it and assess it in a different light. They would need to produce and provide to the court proof of debt. That was never provided. CHAIR: So you could trigger a dispute resolution process first and it might end up in a legal outcome, by way of example. Mr Krepp: Exactly. Court orders would be paramount and foremost. CHAIR: The enormous impact that this has had on you, your family and, indeed, your associates is apparent. I thank you for your evidence but also very much acknowledge the role that you've played in supporting other victims. I hope you take some comfort from the strong networks you've helped to form for people who are seeking justice. Are there any other questions from the committee? Senator IAN MACDONALD: I asked a few questions and I might speak to Mr Krepp privately later, but I'm not quite sure how this helps us with this particular inquiry. Mr Krepp: Possibly from the justice point of view—it was overlooked, ignored and sidestepped. Senator IAN MACDONALD: You tried to get into Hayne but you weren't called? Senator IAN MACDONALD: And I'm conscious of some of the Storm allegations. Mr Krepp: There were policies swapped in and out. I've seen cut-and-paste documentation. Senator IAN MACDONALD: I've had some evidence of cut-and-paste signatures. Mr Krepp: Can I ask you the question: what's your interpretation of cut-and-paste signatures on a document? Senator IAN MACDONALD: They're fraudulently done by a junior bank officer to get the commission on the loan or something. Mr Krepp: But, if the original document's there, why do you have to do it with the fraudulent one? Senator IAN MACDONALD: I'm going into things that people told me about Storm, which you'd be conscious of. Mr Krepp: I appreciate that. What I'm saying is that the Hayne inquiry didn't dig deep enough. I would call it incomplete in respect of small-to-medium enterprises. Senator IAN MACDONALD: Justice Hayne assures us that he or his senior staff read every submission, which I assume includes yours. Certainly, we'd have been there for the next 10 years if they called everyone to give evidence. It just seems an incredible situation to me. As a lawyer 100 years ago, I always appreciate there are two sides to every argument, but from what you tell us it just seems incredible. This question is again not really relevant to our inquiry, but was it originally the Commonwealth Bank or Bankwest? Mr Krepp: Commonwealth Bank. Possibly one of the things I did fail to identify is that initially it was with another bank and they lured us to get our business, not on one occasion or two occasions but on three occasions. They were domiciled directly opposite to where we were trading, on Lake Street, Cairns. My son and I stepped up our shareholding and bought the business. Because my prime real estate was with CBA, I was happy, but they lured us and quoted us on three occasions for the business. To find out later that they rolled us wasn't very comfortable. I'd been with CBA for 20-odd years or 30 years or something. Senator IAN MACDONALD: There's not much loyalty in banks these days. There used to be once. Mr Krepp: Exactly. That's why I showed you that I was acknowledged for professionalism, being honest and everything else. It's a Commonwealth award granted to me in the Asia-Pacific region for services to banking, being an ex-banker. I endorse what you said. They certainly wouldn't earn them today. CHAIR: Thank you very much for your evidence. What a superb presentation from Selwyn Krepp. The Senators found it difficult to understand how and why bankers would be so callous and nasty while engaging in unconscionable conduct - including asset stripping. The bankers do it because they have structured a system that has up to now allowed them to get away with these types of abuses. Bank warriors are not copping business as usual. It is time for reform ... and warriors like Mr Selwyn Krepp are leading the way towards genuine reforms and remediation. Extend RC - Sign Petition! Spread The Word - Buy TShirt! "Our whole monetary system is dishonest, as it is debt-based… We did not vote for it. It grew upon us gradually but markedly since 1971 when the commodity-based system was abandoned." Should bank CEOs and loan officers face asset seizures and jail terms for criminal banking practices? © Bank Reform Now™ - Australian Non Profit Organsiation - campaigning to put a stop to predatory, unconscionable banking practices. Disclaimer: Comedy, parody and satire will be used across all media platforms during this campaign. Any similarity to legitimate businesses is coincidental. Corrupt business on the other hand will be treated with all due respect.